This is our last day here at the Hotel Anise. We’ve been treated like royalty being the only guests all this time. Last night, Neville the handyman took us in his jeep along the Coast to the Grand Rivière to see nesting leatherback turtles. This is another thing that I’ve always wanted to see, and Aunty was pretty excited as well. After a short but slow and jolting drive along the narrow single file road, swerving around potholes and crossing rivers via bridges made of wooden planks we arrived at the turtle nesting site. This comprised of a large shed, a big desk where we had to buy a beach permit, a small glass case of souvenir trinkets, and a large hall with a video screen. The hall was big enough to seat around 100 people. Before we were allowed out to see the turtles and use our beach permit, we had to watch a video documentary. So we sat in the middle of the front row – the only ones there! Only after the documentary had finished were we allowed out and were greeted by our guide, who promptly ripped our beach permit in half! Then it started to get much more interesting. As soon as we were on the beach we almost fell over a nesting turtle oblivious to all around her. 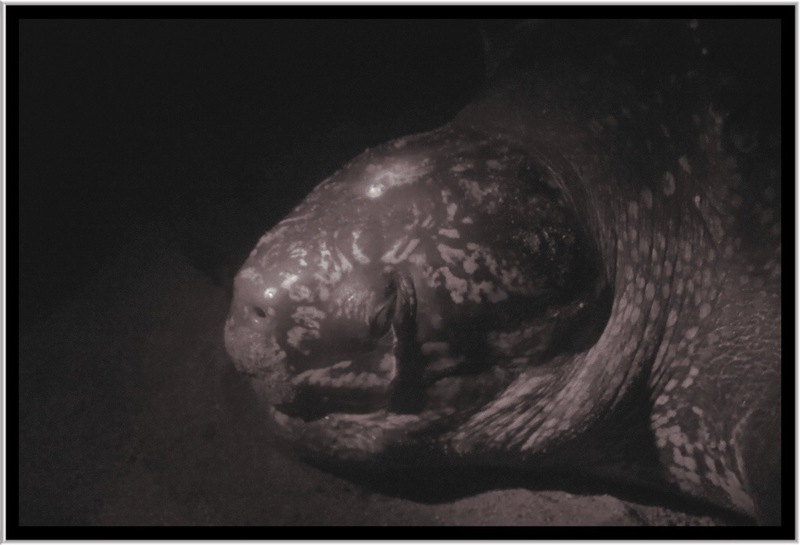 As our eyes started to adjust to the darkness we saw turtles were everywhere, digging, grunting, filling, laying and shuffling in or out of the sea. Because it is all too easy to disturb them with light we were lead around the beach via a small red light torch, but we were able to see plenty. 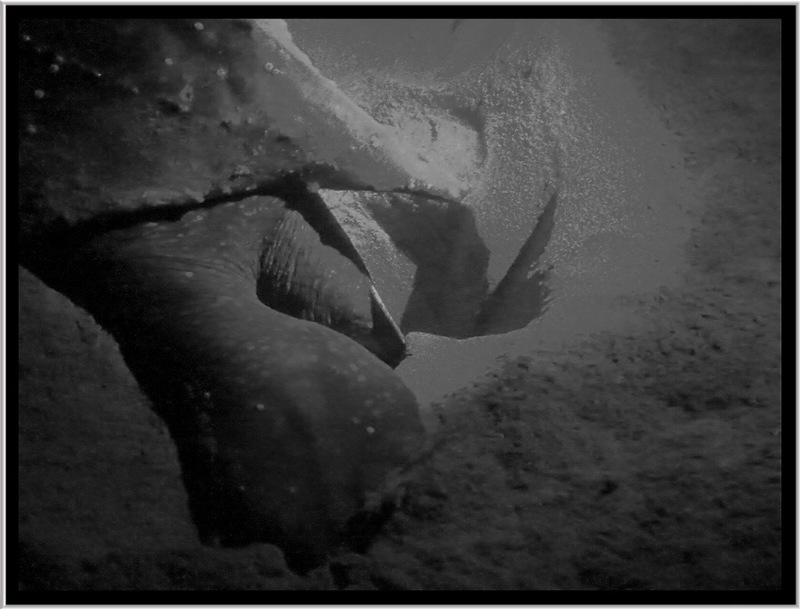 The first turtle we came across was just finishing digging her nest, taking very delicate and dexterous scopes of sand with alternate left and right back flipper. Then when she was satisfied it was deep enough, started laying her eggs. 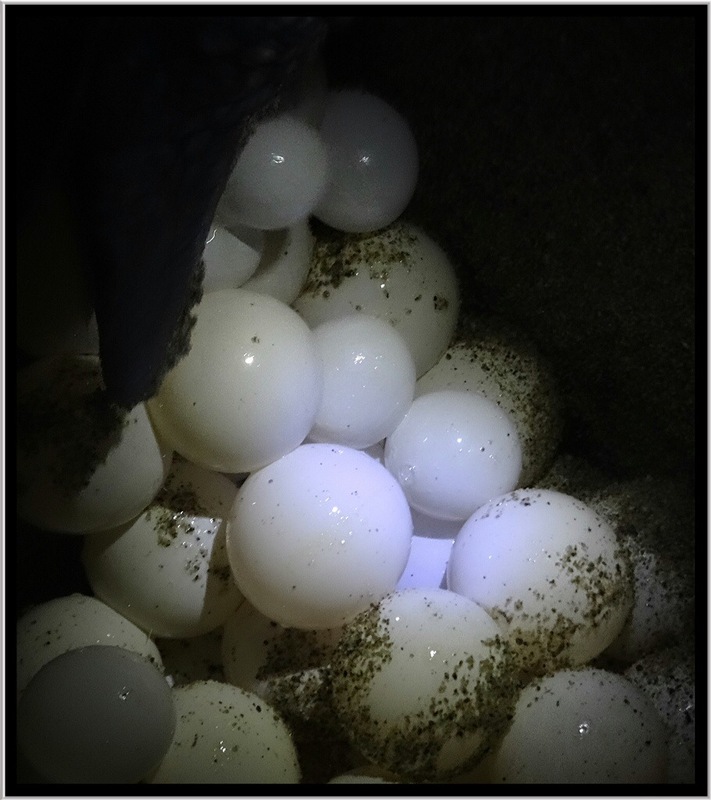 Each nest contains between 80-120 eggs, and she will come up onto the beach about 6-10 times over the next couple of weeks to nest again and again. Later on we watched a huge female haul herself out of the surf and up the shore to nest. She then promptly shuffled between two other smaller turtles causing their carefully excavated nest to collapse, and they had to start again. 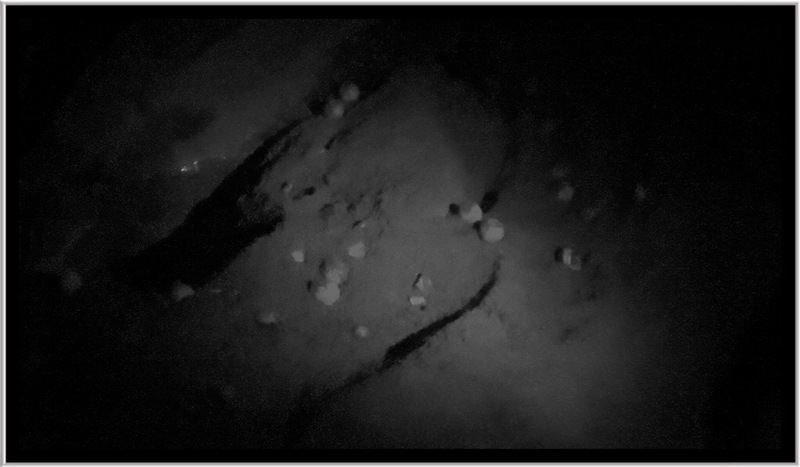 The site she finally chose was the site of a previous nest, and as she dug down into the sand this nest was disturbed and eggs were scattered over the surface. This is a common occurrence with so many turtles coming ashore in a relatively small area. The survival rate from egg to maturity when a female is ready to mate and nest is only 1:1000. This is made worse by the unintentional by-catch in fishermen’s nets. In Trinidad they are trying their best to reduce these unnecessary losses through education, involving locals in research and banning net fishing during the nesting season. This seems to be working as all the locals we’ve spoken too are very proud of the fact that they have one of the largest remaining nesting sites in their area. Let’s hope that all the conservation and education work is not in vain and these fantastic and enigmatic creatures are not lost forever, and continue to migrate the oceans, including as far as the Welsh Coast. 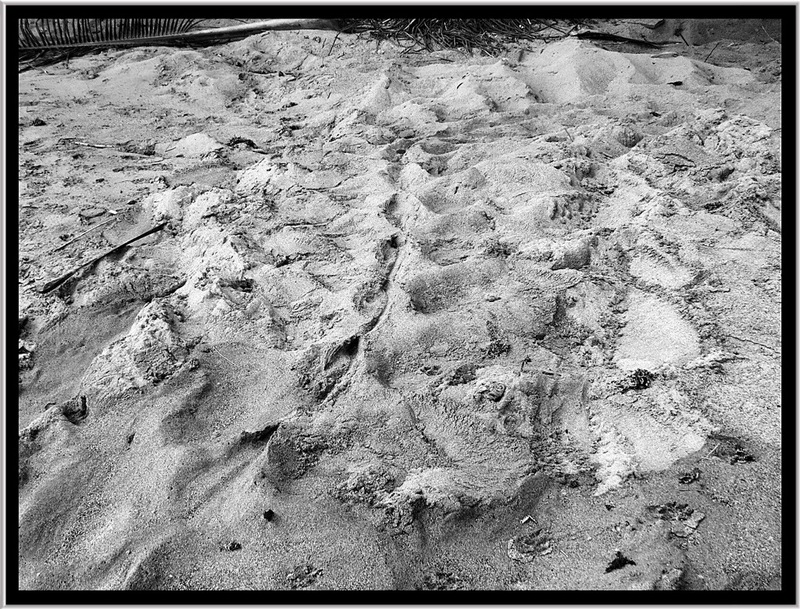 This morning when we woke up we noticed fresh turtle tracks on the beach immediately opposite the hotel. A turtle had nested on the beach here as well last night. The tide had washed most of here tracks away, but there were enough left to show where she had nested. 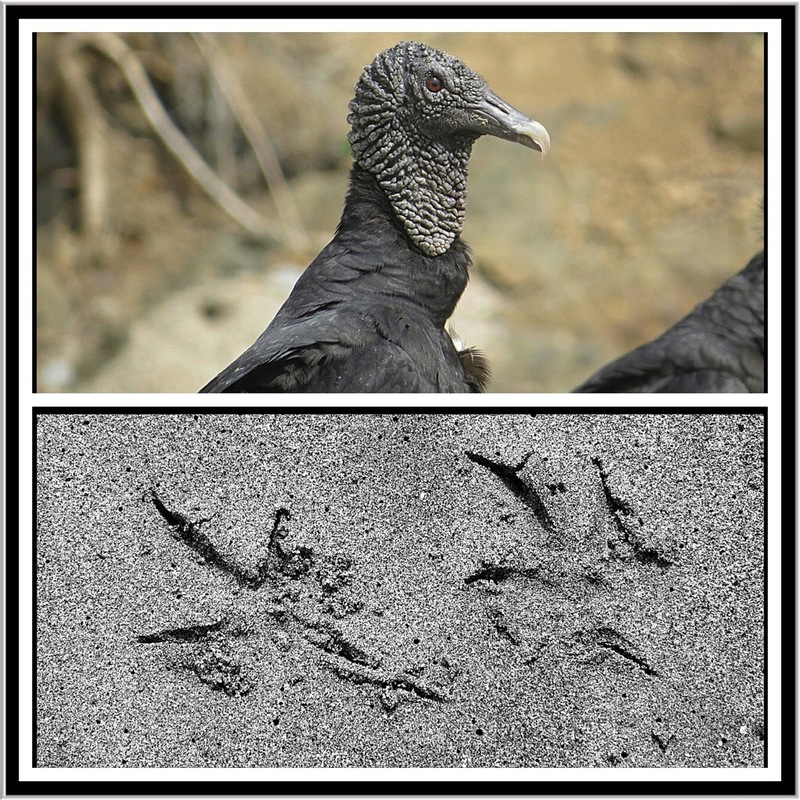 The beach here is also a roost for the Common Black Vulture, and we’ve seen these birds all over the island, so we can vouch for how common they are. During the turtle nesting season they do well feasting on the displaced eggs that are thrown up when nests are disturbed. 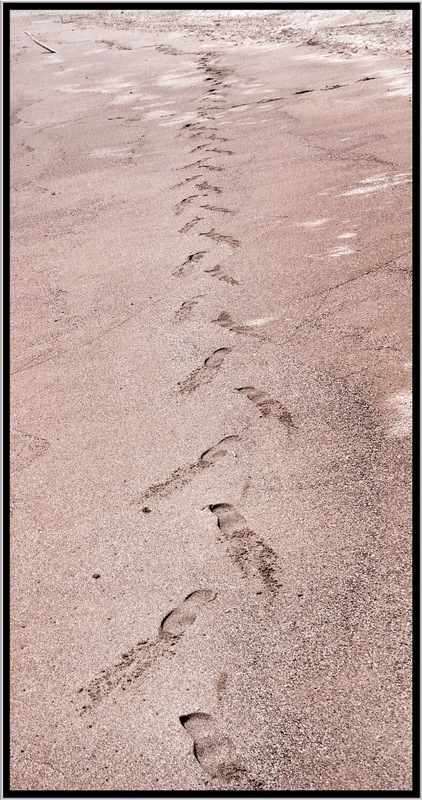 They have left footprints all over the sand on the the beach as they walk, hop and run around. Mind you someone else almost didn’t have the opportunity to leave any footprints at all. We noticed a local clambering over the rooks collecting seaweed maybe. 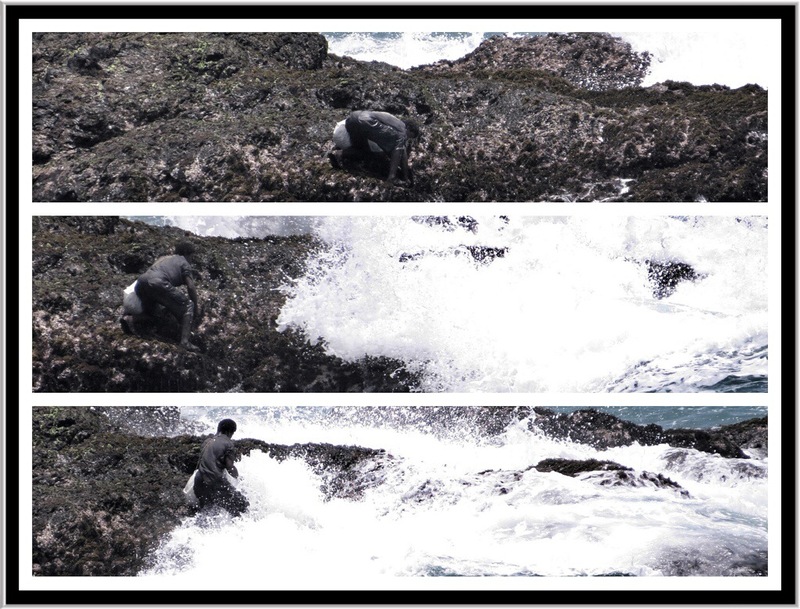 At one point he was caught off guard by a wave, but was still standing afterwards. We left our own footprints in the sand knowing that they will only be there until the next tide washes them away. But in the hope that despite the ephemeral nature of footprints in the sand the natural beauty of Trinidad will continue for future generations to enjoy.